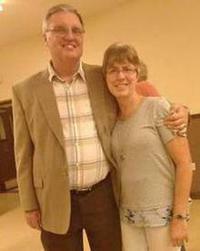 Sebring COTN welcomes Pastor Mark and Valarie Montgomery as the Senior Pastor to our Community of Faith. Pastor Mark and Valarie have a heart for God, for His Church, for people, and have a missional passion to see people come to know Jesus. Mark has pastored churches in Illinois and Michigan with over 37 years of experience in both the church and business world of leading people, building teamwork, recuriting and developing leaders, and equipping staff. He has a passion for church planting and served as the Michigan District Director of the NewStarts strategy team. He has also served on the regional task force of "Organic Churches". Mark received his undergrad from Olivet Nazarene University with a Bahelor of Arts degree in Religion, and completed his Master of Divinity degree from Nazarene Theological Seminary. He has also completed various training programs in church planting and financial planning. Valarie graduated from Michigan State University with a Bachelor's degree in Accounting, and also completed a Master of Science degree in Accounting from MSU. She has over 25 years of experience in these areas. HOUSE of PRAYER - Wednesday @ 7:00 p.m.